"Ferrari F150" redirects here. It is not to be confused with LaFerrari. 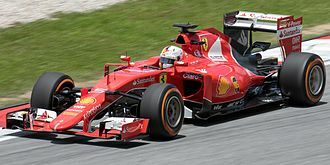 The Ferrari 150° Italia, formerly known as the Ferrari F150, is a Formula One motor racing car built by Scuderia Ferrari Marlboro to compete in the 2011 Formula One season. 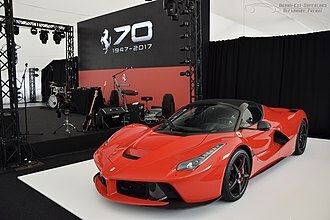 It was launched at Ferrari's headquarters in Maranello, Italy on 28 January 2011, one year to the day after the launch of its predecessor, the Ferrari F10. 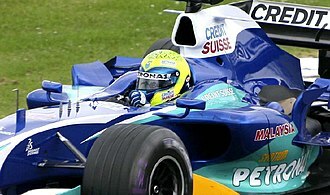 It was driven by 2005 and 2006 World Champion Fernando Alonso, and 2008 championship runner up Felipe Massa. The car's chassis designation was chosen to celebrate the 150th anniversary of Italy's unification. This was seen by some pundits as a political move by Ferrari president Luca di Montezemolo, who founded the Future Italy think tank. In February 2011, Ford declared its intention to sue Ferrari over the use of the F150 name, to which Ford owns a trademark. In response, Ferrari began to refer to the car as the "F150th Italia", claiming the original F150 moniker was simply an abbreviation. 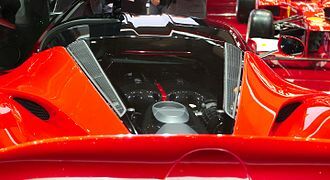 On March 3, Ferrari announced that the name had again been tweaked to "Ferrari 150° Italia" (the 150º pronounced as the Italian ordinal centocinquantesimo), and that Ford had withdrawn its legal challenge. 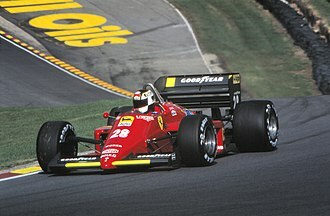 When the season began in Australia, many were surprised by Ferrari's noticeable lack of pace, particularly in qualifying. Alonso and Massa were 1.4 and 2.0 seconds slower than polesitter Sebastian Vettel in his Red Bull RB7, respectively. In the race however, the Ferraris certainly seemed to have decent pace, but their finishing results were still substantially hampered by their poor grid positions, with Alonso finishing 4th and Massa 7th. Their lack of pace continued to hinder their results in both Malaysia and China and after three races, they remain without a podium position and sit third in the Constructor's Championship, already 55 points down on leaders Red Bull. Turkey saw a change in pace for Ferrari, as they were finally able to keep pace with Red Bull. After starting from fifth, Alonso managed to make his way up to second, before being passed by Mark Webber on the 51st lap. 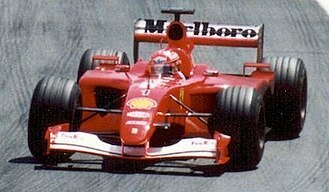 His third-place finish was Ferrari's first podium of the season. Massa, meanwhile, started from tenth place, after mechanical problems prevented him from setting a time in the third qualifying session. Although he managed to get as high up as sixth place, two botched pit stops meant he could only finish 11th, behind Kamui Kobayashi and outside the points. In Spain, Alonso qualified 4th but at the start of the race managed to pass all three drivers ahead and take the lead. But Ferrari again showed a lack of pace and after two rounds of pit stops Alonso found himself behind Mark Webber, who at the time was third. When Alonso switched to hard tyres, the situation became even worse and he was soon overtaken by Jenson Button and was eventually even lapped by race winner Sebastian Vettel, thus finishing in fifth. Aldo Costa, Technical Director, was fired after this Grand Prix (after 5 Grands Prix out of 19). In Monaco, Ferrari was unable to do better than 4th in qualifying. Alonso again had a good start, passing Webber for third. After the Safety Car, Alonso, having pitted, found himself some 10 seconds behind leader Vettel, but having new tyres, started to catch Vettel quickly and soon found himself just behind him. Meanwhile, Button, having pitted after Alonso, had tyres in even better shape than the Spaniard, and he too started catching Alonso and Vettel and soon found himself behind Alonso. Alonso would probably have had a great chances to overtake Vettel but Vitaly Petrov and Jaime Alguersuari had an accident which led to the race being suspended. After the restart, the top three drivers managed to hold their places so Alonso finished 2nd. In Canada, the hard-braking, low-downforce track made the Ferraris show much better pace in qualifying than before with Alonso and Massa taking 2nd and 3rd, respectively, with Alonso just over tenth behind pole sitter Vettel. However, race conditions were bad and after a bunch of pit stops and a delay of the race Alonso was hit by Button and thus had to retire from the race. 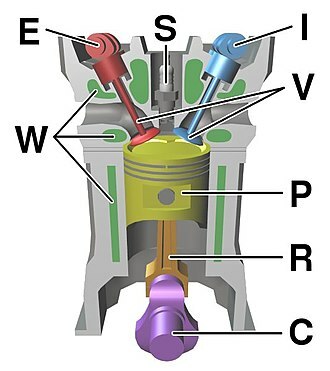 The race in Valencia saw the ban on engine mapping which prevented some teams, especially Red Bull from running extreme engine mapping in qualifying, and thus prevented them being so dominant in qualifying. In the race however, it didn't change much of the Red Bull's race pace so Vettel got away early, while Alonso had to be satisfied with 2nd, which he got after overtaking Webber. At the British Grand Prix, the FIA introduced another ban, this time on off-throttle blown diffusers, which had been developed to perfection by the Red Bull and McLaren teams. However, Ferrari had not based their car on this technology, so this rule helped Ferrari in particular, but it had major effect on Red Bull cars, because they had to thank the technology for their extraordinary pace, both in qualifying and race. It turned out to be so, when Alonso, on a track that suited Red Bull more than any other track, qualified 3rd, just two tenths behind pole sitter Vettel, with Massa a further six tenths behind Fernando, putting him in fourth. The race however, didn't start that well with rain falling, thus allowing the McLarens, which in the rain had even better pace than Red Bull, to overtake both Massa and Alonso. Soon the track started to dry and drivers were heading to the pits for soft tyres. Vettel's mechanics had problems during his pit stop, allowing Alonso to pass Vettel. With the track almost completely dried, the Ferrari 150° Italia started to show how good race pace it had, of course, with the aid of the ban on off-throttle blown diffusers. Alonso though, exited the pits behind Hamilton, started attacking him aggressively and passed him after a few laps. Although Alonso was in the lead of the race, he continued to push and drive with no mistakes, increasing the lead over Hamilton at a rate of more than a second per lap. Soon he was leading the race with more than 15 seconds ahead of the rest of the field with nobody driving even close to as fast as him. Alonso went on to win the race, with team-mate Massa finishing 5th although he had major problems because debris from another car struck his car thus changing the car's behaviour. During the next days, teams agreed to remove the ban on off-throttle blown diffusers. Although it seemed that neither Ferrari nor Sauber would agree because this ban helped them in particular, they didn't want to be the only ones who would insist on keeping the regulations as they were at the moment. At the German Grand Prix, Alonso qualified 4th. He had a good start, soon passing Vettel for 3rd. He kept that pace and soon found himself not far away from the leaders. Alonso had a better strategy than both Webber and Hamilton and took 1st position at one point, but was soon overtaken by Hamilton because of tyre warm-up problems that the Ferrari 150° Italia had all season long. Alonso managed to keep Webber behind and finished 2nd. Massa finished 5th. At the Hungarian Grand Prix, Ferrari had a decent pace on super-softs, but Alonso had made a mistake in Q3, which put him in 5th, behind Massa, who qualified 4th. The race started with a wet surface. This meant that all of the drivers started on intermediates. The Ferraris struggled at the start, losing places, but both Alonso and Massa made their way up through the field. Alonso could have had a chance to threaten second placed Vettel, but he spun off and was forced to settle for third. Massa finished 6th. At the Belgian Grand Prix, mixed conditions in qualifying meant that Massa would start the race from 4th and Alonso from 8th. The start went very well with Alonso taking 5th immediately and Massa moving up to third. 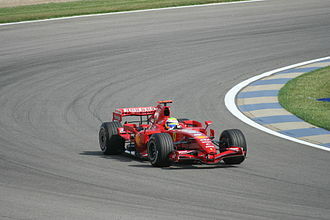 As the race progressed, Alonso came closer and passed both Hamilton and team-mate Massa for third. Soon Vettel pitted, and Alonso overtook Rosberg taking the lead at that moment, but when the safety car was deployed, he didn't come to the pits and so had to drive on older tyres than Vettel. Soon he was overtaken by Vettel, and as the race progressed, worse pace on harder tyres meant Alonso would end up losing 2nd to Webber and then 3rd to Button two laps before the end of the race, finishing 4th at the end. The Ferrari 150° Italia has been featured in the video games F1 2011 and Ferrari Virtual Academy. ^ "Technical specifications". Ferrari F150. Scuderia Ferrari. 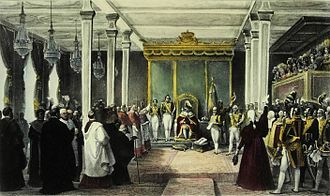 28 January 2011. Archived from the original on 14 February 2011. Retrieved 12 February 2011. ^ Noble, Jonathan (2011-01-12). "Ferrari reveals new car launch date". Autosport.com. Haymarket Publications. Retrieved 2011-01-12. ^ "Ferrari's new Formula 1 car to be called F150". Scuderia Ferrari. Ferrari. 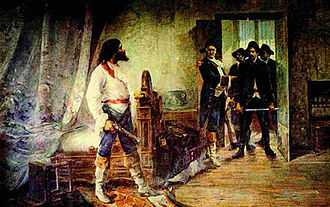 25 January 2011. Archived from the original on 25 January 2011. Retrieved 26 January 2011. ^ Allen, James (2011-01-26). "Montezemolo plays the political card with new Ferrari F1 car". James Allen on F1. James Allen. Retrieved 2011-01-28. 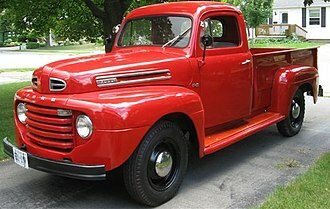 ^ "Ford sues Ferrari over use of F150 name". Yalla F1. 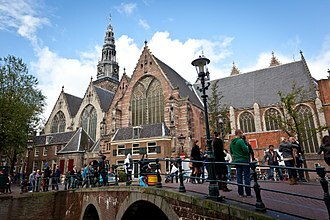 2011-02-10. Archived from the original on 2013-01-05. Retrieved 2011-02-10. ^ "The name of the new Ferrari Formula 1 car". Scuderia Ferrari. Ferrari. 10 February 2011. Archived from the original on 4 September 2014. Retrieved 10 February 2011. ^ "The Horse Whisperer - The name changes but not the sense". ferrari.com. Ferrari S.p.A. 2011-03-04. Archived from the original on 2013-11-05. Retrieved 2011-03-04. ^ Papadopoulos, John. "Ferrari Virtual Academy: Complete + Adrenaline Packs Released". dsogaming.com. Retrieved 8 August 2016. 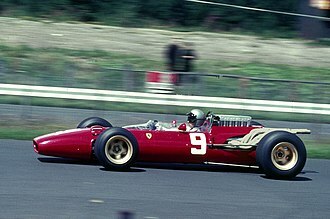 Wikimedia Commons has media related to Ferrari 150° Italia. The 2011 Malaysian Grand Prix was a Formula One motor race held on 10 April 2011 at the Sepang International Circuit in Selangor, Malaysia. It was the round of the 2011 Formula One season. The 56-lap race was won by Red Bull driver Sebastian Vettel after starting from pole position, Jenson Button finished second in a McLaren, and Nick Heidfeld completed the podium for Renault, in third place. As a consequence of the race, Vettel extended his lead in the World Drivers Championship to 24 points over Button. Buttons McLaren team-mate Lewis Hamilton, who finished eighth in Malaysia, fell 4 points behind Button in third, several teams made driver changes for the first practice session. GP2 driver Davide Valsecchi took part, replacing Heikki Kovalainen at Lotus, tyre supplier Pirelli brought its silver-banded hard compound tyre as the harder prime tyre and the yellow-banded soft compound as the softer option compound. This was the same selection that Bridgestone had chosen to bring to the Malaysian Grand Prix for the past two years. Shortly after qualifying, the FIA moved the pole position slot from the left- to the side of the circuit. Before the race, winner of one in Melbourne - Sebastian Vettel - led the Drivers Championship with the 25 points he gained for winning the only race thus far in 2011. The rest of the standings were as the drivers had finished at that race - Lewis Hamilton on 18, in the Constructors Championship, Red Bull lead with 35 points, McLaren were second with 26, and Ferrari were a further 8 behind McLaren on 18 points. Renault were in fourth, just behind on 15 points, Toro Rosso on 4, and Force India on 3, completed the points scoring teams. The first practice session was run in humid but dry conditions, Mark Webber was the fastest driver in the first session, over a second and a half faster than Lewis Hamilton and two seconds faster than Michael Schumacher. Overall lap times were slower at the circuit than in 2010. The session was scattered with incidents, Virgin driver Jérôme dAmbrosio suffered a fault that caused his right-front suspension to fail. A chassis consists of an internal vehicle frame that supports an artificial object in its construction and use, can provide protection for some internal parts. 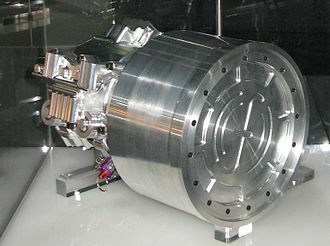 An example of a chassis is the underpart of a motor vehicle, if the running gear such as wheels and transmission, and sometimes even the drivers seat, are included, the assembly is described as a rolling chassis. In the case of vehicles, the rolling chassis means the frame plus the running gear like engine, drive shaft, differential. 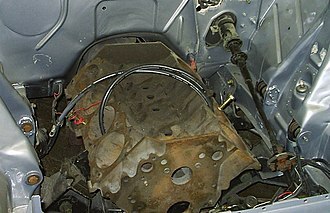 An under body, which is not necessary for integrity of the structure, is built on the chassis to complete the vehicle. For commercial vehicles, a rolling chassis consists of an assembly of all the parts of a truck to be ready for operation on the road. 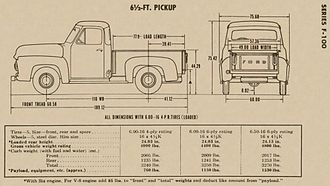 The design of a car chassis will be different than one for commercial vehicles because of the heavier loads. Commercial vehicle manufacturers sell chassis only and chassis, as well as chassis cab versions that can be outfitted with specialized bodies and these include motor homes, fire engines, box trucks, etc. Sebastian Vettel is a German racing driver, currently driving in Formula One for Scuderia Ferrari. He is a four-time Formula One World Champion, having won the championship in 2010,2011,2012 and 2013 with Red Bull Racing and he is among the most successful F1 drivers of all time. He is one of four drivers to have won four or more drivers titles. He is contracted to remain as a Formula One driver with Scuderia Ferrari until at least the end of 2017. Vettel started his career in Formula One as a test driver for BMW Sauber and made his debut with the team at the 2007 United States Grand Prix, in the season, he signed with Toro Rosso and stayed with the team into 2008. He became the youngest race winner at the time when he took victory at the 2008 Italian Grand Prix, in his first year driving for Red Bull in 2009, Vettel finished the season as the youngest-ever World Drivers Championship runner-up. The following year he went on to become the youngest driver ever to win the World Drivers Championship, in the same year he helped Red Bull win the teams first World Constructors Championship. He followed up his first championship with three titles, becoming the youngest double and quadruple world champion in Formula One. The 2011 and 2013 titles saw Vettel dominating the seasons and wrapping up the titles early, after his winless 2014 season he returned to winning ways in his first Ferrari season, being the closest challenger to the dominant Mercedes cars and winning three races. 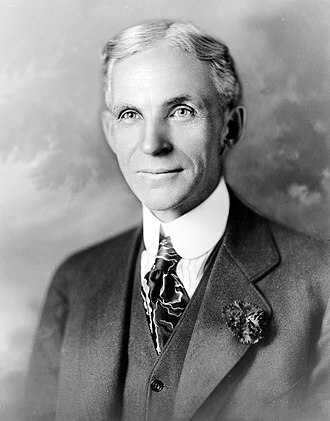 He is currently in place among all time race winners. Vettel was born in Heppenheim, West Germany, to Norbert and he has one younger brother and two older sisters, Melanie, a dental technician, and Stefanie, a physiotherapist for disabled children. Vettel suggested in an interview that he was terrible at school, Vettel is a fan of The Beatles, collecting several records, including Abbey Road and his favourite song being Drive My Car. In an interview on Top Gear, Vettel stated that he was a fan of British comedy such as Little Britain, Vettel lives in Thurgovia, Switzerland amongst other racing drivers and is a fan of German football team Eintracht Frankfurt. Red Bull Racing is an Austrian Formula One racing team based in Milton Keynes, England. It is one of two F1 teams owned by beverage company Red Bull GmbH, the other being Scuderia Toro Rosso, the team won four successive Constructors Championship titles, in 2010,2011,2012, and 2013, becoming the first Austrian licensed team to win the title. The team produced the world champion driver of 2010,2011,2012. Managed by Christian Horner, the team has used Renault engines since 2007, Red Bull Racing used TAG Heuer-branded Renault engines starting from the 2016 season. The current Red Bull team can trace its origins back to the Stewart Grand Prix outfit that made its debut in 1997. Jackie Stewart sold his team to the Ford Motor Company late in 1999, Red Bull, an energy drinks company, agreed its purchase of Jaguar Racing on the final day of the sale,15 November 2004. BBC Sport reported that Ford asked bidders for a symbolic US$1 in return for a commitment to invest US$400 million in the team over three grand prix seasons. The team continued to have access to the Cosworth engine developed for their 2005 chassis, Christian Horner was installed as the new Team boss and lined up David Coulthard and Christian Klien to drive for the team. Red Bull Racing was not the start of Red Bulls involvement in Formula One, after setting up a Formula One team of its own, Red Bull ended its long-term partnership with the Swiss team. 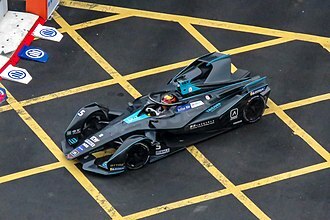 The drinks company runs a young drivers programme, Red Bull Junior Team, high-profile drivers who have received this backing include Enrique Bernoldi, Christian Klien, Patrick Friesacher, Vitantonio Liuzzi and Scott Speed. Red Bull sponsors many drivers and teams competing in the GP2 Series, Red Bulls owner, Dietrich Mateschitz, reportedly tried to recruit former Formula One driver and BMW Motorsport chief Gerhard Berger to help guide the team through its debut season. 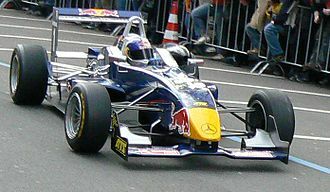 For 2005, the chassis was christened the RB1, Red Bull Racing used Cosworth engines in its maiden year due to the ease of continuing with the engine Jaguar Racing used. 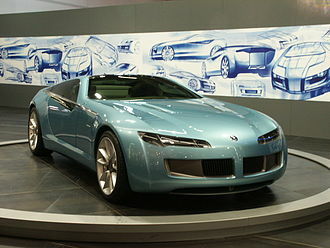 BBS Kraftfahrzeugtechnik AG is a high-performance automobile wheel design company headquartered in Schiltach, Germany. BBS serves North America through BBS of America, located in Braselton, Georgia, BBS produces wheels for motorsport, OEM, and aftermarket applications. The company employs approximately 1,200 employees worldwide, the initials BBS are based on the last names of the two founders and the city in which the company was founded. In 2007 BBS went bankrupt and was taken over by the Belgian firm Punch International, as of July 1st 2015, Nice Corp became the majority owner. In 1972 BBS pioneered the development of a racing wheel. This innovation earned BBS Kraftfahrzeugtechnik the Automechanika Innovation Award 2006 in the tuning segment, BBS entered into a technical cooperation agreement in 1990 with ASA, a Korean company that was starting wheel production. Ltd manufactures the BBS F1 Magnesium wheel and All racing Aluminum wheels, since BBS is a customer of Washibeam, manufacture of the wheel will not be discontinued if BBS goes bankrupt. BBS has and continues to supply OEM wheel applications to a number of automobile brands, lexus began using BBS wheels on its IS-F when launched in 2008, updating the design for the 2010 model year and again for 2012. SpA is a multinational company based in Milan, formerly listed on the Milan Stock Exchange since 1922. It was acquired in 2015 by ChemChina, the company is one of the largest tyre manufacturers behind Bridgestone, Michelin and Goodyear. It is present in over 160 countries, has 20 manufacturing sites in 14 countries, Pirelli has been sponsoring sport competitions since 1907 and is the exclusive tyre supplier for the Formula One Championship for 2011–2019 and for the FIM World Superbike Championship. Pirelli is now a pure tyre manufacturing company, in the past it has launched fashion project and operated in renewable energy and sustainable mobility. 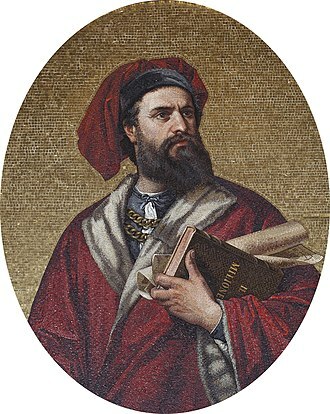 Founded in Milan in 1872 by Giovanni Battista Pirelli, the company specialised in rubber and derivative processes. Thereafter, Pirellis activities were focused on the production of tyres and cables. In 2005, Pirelli sold its division to Goldman Sachs. 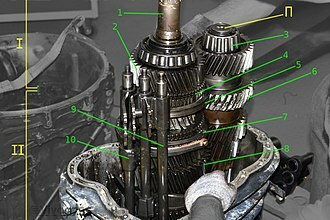 In the 1950s, Alberto Pirelli commissioned the building of a skyscraper, Pirelli Tower, in 1974, Pirelli invented the wide radial tyre, upon a request from the Lancia rally racing team for a tyre strong enough to withstand the power of the new Lancia Stratos. At that time, racing tyres were either slick tyres made with the cross ply technique, or radial tyres, both were unusable for the Lancia Stratos, as the radials were destroyed within 10 km, and the slicks too stiff. Lancia asked Pirelli for a solution, and in 1975 Pirelli created a wide tyre with a reduced sidewall height like a slick, Porsche started using the same tyres with the Porsche 911 Turbo. In 1988, Pirelli acquired the Armstrong Rubber Company, which was headquartered in New Haven, Connecticut, in 2002 the company started a range of Pirelli branded clothing and eyewear. In March 2015, it was announced that Pirelli shareholders has accepted a €7.1 billion bid from ChemChina for the company, the transaction was completed and the company was delisted in November 2015. 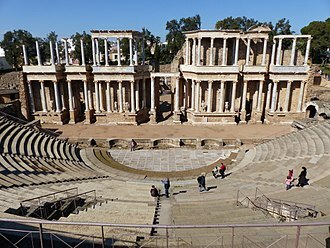 The list of Pirelli main shareholders As of September 2016 The list of Pirelli Board of Directors, the Pirelli Calendar is published annually, and regularly features famous actresses and fashion models. The Pirelli Internetional Award is given annually for the best international multimedia involving the communication of science, power is nothing without control is the well known slogan of Pirelli Tyre Company, and is featured in numerous television and print advertisements. Sergio Pérez made his Grand Prix début with Sauber. Narain Karthikeyan at the wheel of one of the Hispania F111s. Karthikeyan and team-mate Vitantonio Liuzzi failed to qualify for the race as they were outside 107% of Sebastian Vettel's time in the first part of qualifying. Lewis Hamilton was Sebastian Vettel's closest challenger all weekend finishing 22 seconds off the lead. 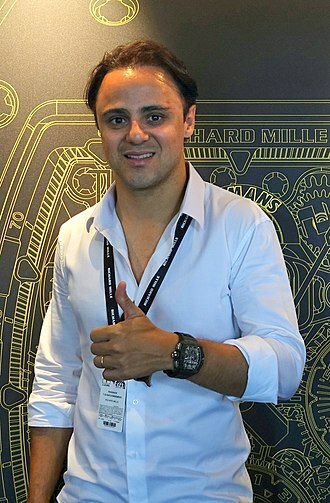 Felipe Massa had a disappointing race, and finished down in ninth place (which became seventh after the race, due to the Saubers' disqualification). Narain Karthikeyan drove in the first free practice session for HRT. Lewis Hamilton was involved in an incident with Felipe Massa, disadvantaging both of their races. Sebastian Vettel took his ninth victory of the season by 1.7 seconds from Jenson Button, and nearly half a minute in front of teammate Mark Webber. Sébastien Buemi's Toro Rosso shed part of its sidepod during qualifying. Lewis Hamilton and Fernando Alonso battle during the race. 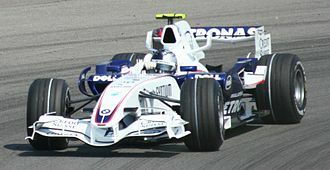 David Coulthard driving for the team at the 2007 Canadian Grand Prix. Mark Webber driving for RBR at the 2007 British Grand Prix. Note the special Wings for Life livery. David Coulthard driving for RBR at the 2008 Canadian Grand Prix. Sebastian Vettel driving the RB5 at pre-season testing at Jerez. BBS wheels on a Porsche 911 GT3 Coupe. 1985 BMW M635CSi wearing the stock BBS RS007 wheels.